Welcome back to the Ray Pest Control blog! 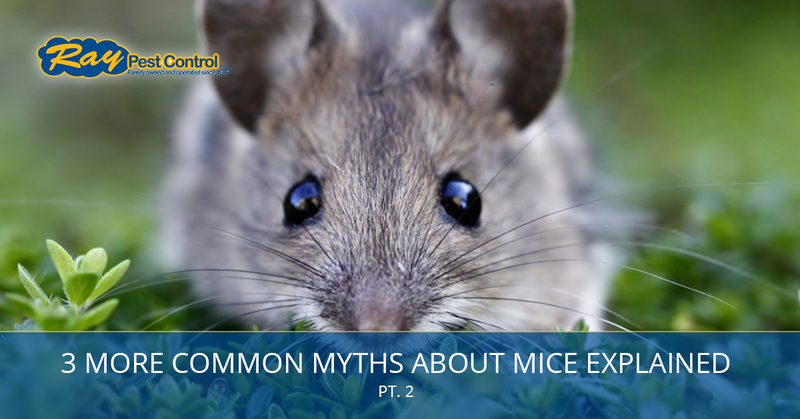 In part one of our two-part blog series, we began looking at some of the myths associated with common house mice. As your Top Rated Local® pest control team in Piedmont, we feel it is our duty to inform you about these pesky critters since they are incredibly common in our area. Having a better understanding of mice can help you better protect your home from a mice infestation, and can help you identify when you need to call in the pros for a mice removal. Let’s look at few more myths about these pests in today’s blog post. True. While it is common to see mice scurrying around during the day, they are nocturnal, meaning they are much more active at night. Mice are cautious creatures and are always on the lookout for stalking predators, curious pets, and frightened people. Yet, they are always on the move looking for food and water. But they feel less threatened at night which is when they generally search for food, water, nesting materials, and shelter. Mice will, however, move more freely during the day in places like pubs and nightclubs where there is more human activity at night. True and false, but mostly false. Thanks to children’s stories, films, and television shows, this is one of the most common myths about mice. Yes, it is true that some house cats may eat, or at least kill or injure, a mouse they find running around your home or property. But it would be a bad idea to rely solely on your cat to take care of your mice problem. Having a cat or even a dog in your home could reduce the risk of mice entering your household, as mice are skittish about other animals and are always on the lookout for possible predators. The trouble with mice is that they tend to settle in places such as attics and wall voids where cats and dogs may not be able to go. What’s more, domesticated cats would probably prefer their usual diet of kitty food over a furry rodent, even though they might be fun to play with for a time. Yes, farm cats and feral cats may be more interested in gobbling up a mouse, but you certainly wouldn’t want to count on them to protect your home from mice. Bottom line — a cat could deter mice from openly dashing across the surfaces of your home, but your cat is not a reliable pest control expert who can remove mice from your home for good. Your best bet is to call Ray Pest Control to take care of your mice infestation. True and false. If you have mice in your home, it’s because something in your house enticed them there. Mice are attracted to food and water sources, and will seek out shelter to live, mate, and raise their young. Mice will often seek shelter in people’s homes during the cooler months here in Piedmont, so it could be as simple as them wanting to escape the cooler temperatures. Your home provides them with everything they need to thrive: plenty of food, access to water for drinking and bathing (yes, they clean themselves), and the shelter they need to stay protected from the elements and predators. Whether a mouse caught the scent of your pet’s food stored in the garage, or the food stored in your pantry, they were likely attracted by these food sources. And keep in mind that mice can fit through holes the size of dimes, making it easy for them to enter your home through cracks and gaps. While most of us strive to keep our homes clean, crumbs, pet food, and other possible food sources fall on the floor and into crevices that we can’t always reach. A good rule of the thumb for avoiding mice in your home is to maintain a clean, clutter-free household, and to always clean up messes and spills immediately so you don’t attract mice and other rodents. If you have mice in your home, there is no reason why you have to continue sharing your space with them. You have worked hard to have a home that is comfortable and safe, and when you have a mice infestation, this compromises your sense of comfort and security. That’s why at Ray Pest Control, we’re just a phone call away and will come to the rescue when you need effective, long-lasting mice removal. Contact your Top Rated Local® rodent and pest control team in Piedmont today and we’ll get rid of those mice for good!